F.R. Richey was a tailor I photographed in 1968 in Athens, Ohio. He was in his 80s when I met him. He died at 96, after spending 70 years patching and sewing. 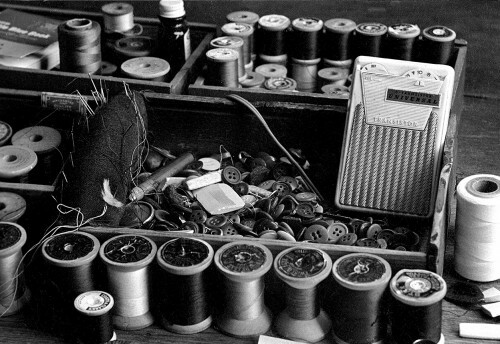 This detail shot of his spools and a transistor radio got me to thinking about early radios I remember. If you sew or are interested in radios, click on the photo to make it larger. I wrote earlier about having a transistor radio that looked a lot like this one when I was delivering newspapers. Looks like Mr. Richey’s radio was a later model that actually had a speaker instead of making you listen through an earphone. My first electronic project was to build a crystal radio set from a Cub Scout kit bought at Buckner-Ragsdale. A crystal set consisted of an antenna to pick up the radio signal and convert it to electric currents; a tuning coil; a galena crystal that you touched with a fine piece of copper wire (the cat whisker); a ground and a pair of earphones. I used a gutter for the antenna. After getting everything hooked up, I would sit around carefully poking the pebble-sized crystal with the cat whisker until KFVS or KGMO would come flowing in. I don’t remember if I was ever able to pull in the St. Louis stations. They could be made even simpler. During World War II, soldiers would make “foxhole radios” from a coil of wire, a rusty razor blade, a pencil lead and a pair of headphones. Because they were “passive” receivers, they couldn’t be discovered by German radio detection equipment. Dad had a suitcase-sized “portable” radio that would shock the bejeebers out of you if you touched any of its metal parts when it was plugged into the wall. Ken, I think there were quite a few of us boys that played with a crystal radio set. In both of the situations that you described, the galena (lead) crystal and wire or the rusty razor blade and graphite pencil lead were creating a diode that would convert the alternating current from the radio waves into pulsing direct current that worked better with the earphone. Changing the number of windings of wire in the coil would change the frequency range that the little tuner would receive. After playing with the home-built variation, I was given a little crystal radio that looked like a black and red rocket. The nose cone could be pulled out or pushed in, changing the tuning using a ferrite, or compressed, powdered iron, plug to vary the electromagnetic properties of the coil. It had a long lead that could be connected to a longer wire or like you indicate, a gutter and another wire that would be hooked to a good ground like a water pipe. I used to listen to WLS, 890 in Chicago, at night before Cape had much in the way of rock music available. What a circuitous route that created that ultimately lead to what I do for a living. I had a Hopalong Cassidy radio…. Does that count??? My friend Mike took a crystal radio to the Antiques Road Show in Milwaukee in 2010 and no one there knew what it was or its value. My dad worked for the Pepsi company in Vincennes, Indiana, for about 30 years(1945-1975). The company stationary he brought home throughout the 1950’s and 60’s, that my brother and I turned into paper airplanes, is now worth about $25.00 per sheet. Also, he brought each of us kids home a “new” transistor Mountain Dew Radio (shpaed like a moonshine jug) in the late 50’s and well as one that was a minature Pepsi cooler. My sister still has them both and they still work. I also had a Cub Scout crystal set and and later on one of the little rocket style radios. Same concept as the Cub Scout model but more user friendly. My first real radio was a 6 transistor Philco that I bought at a Western Auto store in Muskogee Oklahoma for about $20 as I recall, huge dough in 1960. Later on in the 70’s I toyed with building some kits by Dynaco for a pre amp and tuner. Really just a paint by numbers kind of thing, no science involved on my part but Dynaco was pretty good quality stuff back then. That pre amp and tuner coupled with two McIntosh tube amps, MC 30’s made in 1959 (mono so the need for two for stereo and 30 real watts and 30 lbs. each) was my main rig for many years. Still have them and they still work but they have been retired for decades. Just another stroll down memory lane. Thanks for the reminder. I got hooked for a while on shortwave radio by Doc Eugas, who worked with the Boy Scout troop at Centenary Methodist Church (before it was Centenary United Methodist Church) to help us earn our Ham radio merit badge. Part of the process included building a crystal radio receiver which would pull in a few local stations as well as some of the 50,000-watt clear-channel stations like Nashville’s WSM and New York’s WOR. What I remember most, however, is the wonder of round-the-world communication Doc and his radios opened up for me. Doc knew well the magic of his craft and was able to pass it on to a bunch of young-uns who soaked it up. Doc Eugas was a class act. He and Dad were great friends.